CD Sony BMG (Columbia) CDX 71116 (complete CD of The Snowman, first with narration by Bernard Cribbins second without narration). Available from from Amazon and other retailers. The 1985 Aled Jones cover version of "Walking In The Air" is available from EMI. The people far below are sleeping as we fly. I'm finding I can fly so high above with you. The forests and the streams. Nobody down below believes their eyes. The Snowman has been essential seasonal TV viewing for nearly four decades. But experiencing it on Snape Maltings’ big screen to the accompaniment of live orchestra adds an extra special magic that appeals to the excitable child in all of us. Before the film, a musical meeting with the ever-popular Paddington, and the narrated tale – with orchestra – of his first concert experience and the predictable mayhem that follows. 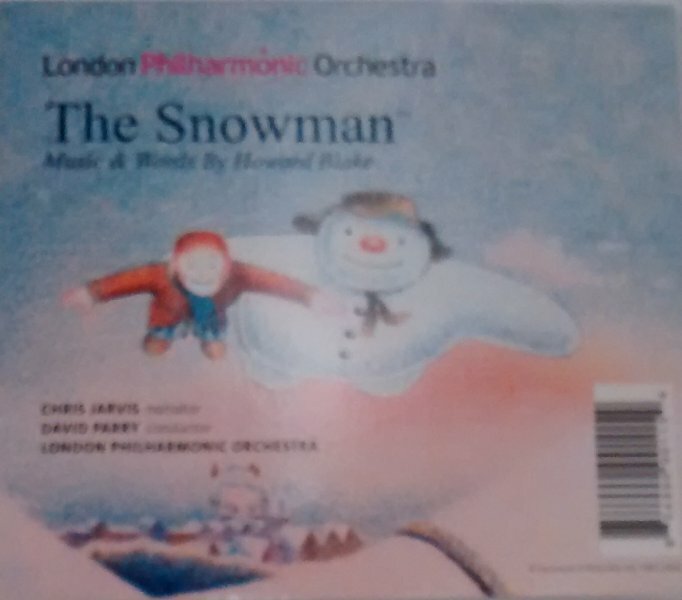 Arguably the most cherished soundtrack to the Christmas season is the score to Raymond Briggs’ The Snowman. This December the Orchestra of Opera North performs the music live in all its heart-melting splendour to a screening of the animation. Sure to captivate the imaginations of young and old alike, this is not only the perfect way to spend time with loved ones, but a wonderful introduction to the thrills, chills and power of a symphony orchestra performing live. Before the screening, narrator John Savournin delights with the classic rags-to-riches tale of Cinderella with sensational music and illustrations to accompany the story. - Music from films and traditional Christmas songs. The heart-warming animated Christmas film The Snowman has been a beloved staple of family holiday entertainment for over 30 years. Your Cincinnati Pops perform Howard Blake’s beautiful score live as the movie plays in high definition over the stage. The first two public live performance of Howard's new animated film 'The Land of Counterpane' (2016), projected on screen with live children's choir and orchestra took place on Sunday 18th December at 2pm and 4 pm to capacity audiences in the Snape Maltings concert hall in a Howard Blake double-bill along with the original film of 'The Snowman' film (1982). Great performances by the National Youth Children's Girls Choir and The Suffolk Ensemble Orchestra led by Cleo Gould and conducted by Ben Parry. The concert was the brain-child of Proms director Roger Wright moved to Suffolk to preside over the music of Aldeburgh. The release of the new duet version of 'Walking in the Air' on Aled Jones's 'One Voice at Christmas' album caused a flurry of publicity over Christmas 2016. Howard was invited to take part in the top celebrity chat show on BBC Radio, the Graham Norton show, to talk about his long-lived musical career and was asked questions about his role in 'The Italian Job' with Quincy Jones, his beginnings in a pub in the Edgware Road called The Lord Chancellor, his role as pianist at Abbey Road at the time of the Beatles and how he came to write the soundtrack of the worlsd-famous animated film 'The Snowman'. December 2016 The newly named Classical KING FM Family Concerts presents four hour-long symphonic programs for children ages 6 to 11 and their families on Saturdays at 11 a.m. in the S. Mark Taper Foundation Auditorium. Formerly called the Discover Music series, each concert is preceded by special performances and activities in the Samuel & Althea Stroum Grand Lobby one hour before the performance. The series will open on Halloween with Magic Circle Mime performing "Phantoms of the Orchestra," a musical adventure that includes Dukas' The Sorcerer's Apprentice, made famous by Disney's Fantasia. The series continues in December as the Symphony performs live from Howard Blake's award-winning soundtrack along with a screening of the cherished animated film, The Snowman. The Seattle Opera Youth Chorus will join the orchestra for the popular song from the film, "Walking in the Air." In March, ensemble Really Inventive Stuff will take part in a vaudeville-inspired production of Prokofiev's Peter and the Wolf. The series closes in May as the ARC Dance Youth Company joins the Symphony on stage for an enchanting performance along with Carnival of the Animals by Saint-Saëns. In addition to The Snowman, music by Vivaldi, Piazzolla, Tchaikovsky and Guilmant wil be performed. Howard Blake conducts screened versions of 'The Snowman' and his new film 'The Land of Counterpane'. The programme will include music from Star Wars, The Lord of the Rings, The Good the Bad and the Ugly, Schindler's List, James Bond and other famous film scores. Hall Plan International classical music festival "Arts Square 2014"
28 December 2014 Hong Kong(China)The Snowman, The Bear, City Chamber Orchestra of Hong Kong conducted by Colin Touchin - Sha Tin Town Hall Auditorium, City Chamber Orchestra of Hong Kong, Colin Touchin, guest conductor Tania Martin,Music by Howard Blake Original stories by Raymond Briggs Spice up your winter holidays with Howard Blake's The Snowman & The Bear! These two animated films, both heartwarming and magical, are based on picture-books by Raymond Briggs. Experience them on the big screen to the sounds of live orchestral accompaniment and singing. The perfect holiday treat for all the family. And, I’m sure you all may have seen “The Snowman” animated short film but for ease of reference, here’s the clip where the magical snowman takes the young boy on a night-time flying adventure where they experience many bird’s-eye views, including the ever-so-phenomenal dancing aurora. The video is also currently featured on the NASA home page @ http://www.nasa.gov within the “NASA Multimedia” videos section located near the center of the page. 1st June 2008 Macao Orchestra, Yan Chan, Macao International Festival, Macao S.A.R. Now this brings back some memories. A bit before my time I will admit, but still an amazing holiday film. Based on author Raymond Briggs' children's book, the movie is wonderfully animated and extremely enjoyable. The story follows a young boy who builds a snowman, which later comes to life. It (it looks like a snowman, but who am I to judge?) and the boy have magical adventures through an amazingly animated winter wonderland. While still a children's story, it is a great piece of film. In later versions of the movie, David Bowie was cast as the narrator. But what really sets this story apart in my mind at least is the music that goes along with it. It tugs at my heartstrings every time I hear it, and give me the goose bumps without fail. Walking in the Air is an amazing song that you have probably heard before, but don't know where from or its actual origin. Singer Songwriter Howard Blake wrote the song for the movie, and it has been covered over and over again. Artists who have covered the song include Barry Manilow & Celine Dion in a duet, Kenny Loggins in his 1998 album December, Chloe Agnew and the Celtic Women and also operatic metal group Nightwish. The song has also been covered this year by up and coming British rock band the Maccabees. The Maccabeess and Nightwish versions are currently my two favorites, but they are all amazing and I urge any music lover to check them out. The original version can be found here, with the accompanying video. Although it was not advertised as a family event, it goes without saying that including Howard Blake’s The Snowman is guaranteed to bring out parents and their children – from toddlers to teenagers. A large screen had been set up in front of the organ pipes, the narration was very skillfully handled by Siobhan Redmond and there was an excellent boy soprano soloist. It caught and held the attention of one and all – from start to finish. Raymond Briggs doesn't do Disney-style crowd-pleasers - so it seems to perplex him that the film of his book The Snowman has become a beloved festive staple and merchandise-monster over the last 25 years. Given the subject - a magical snowman and a night-time flight to meet Father Christmas - avoiding schmaltz must have been hard. But the speckled pencil drawings, the simple, silent storyline, Howard Blake's immortal music and that heart-breaking ending make for an achingly beautiful and wholly sugar-free masterpiece of old-school animation. A more sophisticated tale of friendship and loss than any wordy, plastic-looking CGI cartoon could muster nowadays, The Snowman is an inevitable Christmas classic - whether its creator likes it or not. Original Review: An undisputed animated classic, The Snowman is a magical adaptation of Raymond Briggs' well-loved storybook, telling the tale of a young boy who builds a snowman one Christmas Eve, which comes to life that night and takes the boy on an unforgettable trip to the North Pole to meet Santa Claus. It's a simple story of childhood wish fulfilment, told with loving attention to detail and superbly stylised renderings, and since its initial release in 1982, the film has gone on to be heralded as one of the best animated short films ever made. Every year over the Christmas period, in the UK at least, the TV station Channel 4 screens the film, allowing families both young and old to enjoy this wonderful piece of seasonal tradition time and again. As the story of The Snowman unfolds completely without dialogue, Howard Blake's masterful score takes on increased significance. In recent years, Blake has virtually disappeared from the film scoring scene, despite a healthy career during the 1960s and 70s when he wrote excellent music for films such as The Duellists and Riddle of the Sands, and had his scheduled slot to score the film Alien taken by some bloke called Jerry Goldsmith... But if Blake never writes another note of film music in his life, his reputation in the genre's history will undoubtedly be secured by his contribution to this film, especially the legendary song "Walking In The Air". Written to accompany the scene in which the Snowman and the boy take flight and make their epic journey northwards to see Father Christmas, Blake employed the talents of St. Paul's Cathedral choirboy Peter Auty to lend voice to his exquisite melody and his poetic words. With opening chords that allude to John Williams E.T., a spine-tingling chorus and an instrumental bridge to die for, "Walking In The Air" went on to attain world-wide fame when it was subsequently released as a single by the famous boy soprano Aled Jones in 1985. The remainder of Blake's score is presented in two suites, running at 15 and 6 minutes respectively, either side of the song. Although necessarily a touch cartoonish in nature, Blake convincingly and cleverly manages to convey the good humour and emotion and magic in the story with a series of wonderful interconnected cues, all of which are performed with life and spirit by the Sinfonia of London. Among the highlights include the mock Caribbean-rhythms for when the Snowman is "sunbathing" in front of the fridge, the lovely music-box theme for the Snowman's dance around the boy's bedroom, the wonderful woodwind and xylophone scherzo for the pair's chaotic motorbike ride round the garden, the magnificently vibrant source music for the Dance of the Snowmen, and the bittersweet rendition of the Walking In The Air theme as the pair reluctantly fly home. Columbia's album, which is apparently extremely difficult to find outside the British Isles, is one of the most intelligently structured I have ever encountered. As the entire score only runs for just under 26 minutes, the music is presented twice - firstly with narration by character actor Bernard Cribbins reading extracts from the book, and secondly as an unbroken suite of narration-free music. Whoever took the decision to release the CD in this format should be unreservedly congratulated for their vision: not only does the two-half technique mean that you get a 50-minute CD, but you also get a choice of how to experience it. For those unfamiliar with the film, Cribbins' voice provides a welcome connection between the music and the on-screen action, while for those who wish to experience Blake's delicate touch and detailed orchestrations can simply skip forward to track 4 and indulge themselves. 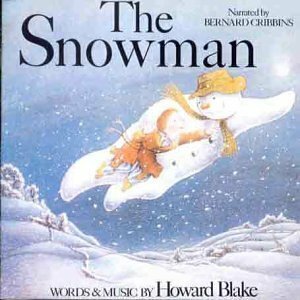 Many people the world over have taken the film of The Snowman to their hearts, and a similar number have embraced Blake's score with equal enthusiasm. Even disregarding the near-legendary song, Howard Blake's lively music for this animated masterpiece will surely stand the test of time and go on to be part of Britain's Christmas traditions for many years to come. Though Blake has written classical pieces, other film scores, music for a number of theatre productions, and even a second Briggs animation (The Bear), the majority of people still consider this composition to be the seminal work of his career.